Two studies published recently in the Journal of Animal Physiology and Animal Nutrition have identified undesirable elements associated with hyperflexion in horses. In one study, hyperflexion was found to compress the laryngeal opening. In the other, conducted by the same four German researchers, hyperflexion was found to induce a stress reaction in the 18 studied horses. In the first study, Andrea Zebisch and her colleagues set out to assess the effects of different head-neck positions on the larynges of ridden horses. 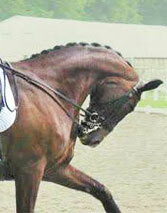 Hyperflexion – the strong deflection of the horse’s head, poll and neck – was a prevalent training technique in equitation, they wrote. Video recordings of the larynges of 14 horses were taken using an overground endoscope. The videos were recorded at rest and during three different riding phases: firstly, in a stretching posture, secondly, in a working position and, thirdly, in hyperflexion. A comparison between the analyses of the working position and hyperflexion phases revealed a significant reduction in the laryngeal opening area. “Other parameters of the larynx evaluated also showed a significant diminishment,” they reported. “These changes did not correlate with the age of the horses or their level of education, and they were independent of the individual anatomical conditions of the poll-neck region. In their other study, they evaluated the influence of different head-neck positions on physical and psychological stress parameters in 18 ridden horses. They measured heart rate, heart-rate variability and levels of the stress hormone cortisol in the blood. Values were recorded at rest, while riding with a working head-neck position, and while riding in a hyperflexed position. Rideability and behaviour during the different investigation stages were evaluated by the rider and by an observer. Little variation in heart rate or heart-rate variability was noted among the horses between the working head-neck position and hyperflexion. However, blood cortisol levels revealed a significant increase in hyperflexion compared to a working head-neck position. Evaluations by the rider and observer resulted in clear changes of rideability and behavioural changes for the worse in all parameters collected between a working head-neck position and hyperflexion. “In conclusion, changes of the cortisol blood level as a physical parameter led to the assumption that hyperflexion of head, neck and poll effects a stress reaction in the horse, and observation of the behaviour illustrates adverse effects on the well-being of horses during hyperflexion,” they said.